Autolyse, it’s what everyone does. However, were you aware that doing an autolyse when you are dealing with a weak dough can be detrimental? During autolyse the enzymes, especially the protease enzyme “eats” gluten. The purpose of that is to help make the dough more extensible (stretchy) so that it has a nicer open crumb and a bigger oven spring. Autolyse actually weakens the dough, it weakens the gluten. Autolease also allows the gluten and fiber of the grain to absorb the water and become more fully hydrated. These can be two separate things, gluten weakening and dough hydration. (I might be forgetting a few, but any time you are dealing with dough that is weak, with a weak windowpane, a spreading dough, a dough that seems too wet, warm dough or dough that tends to over-ferment too quickly). Then DON’T do an autolyse! Autolyse doesn’t automatically equal a better dough. It’s not always appropriate, especially when you have a weak dough or are using a weak/low quality flour. In these instances protect your gluten! Add salt right away during mix. Salt acts to strengthen dough and it inhibits the “eating” action of the enzymes. 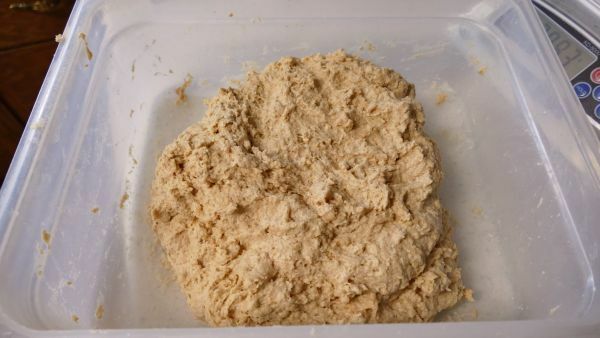 Fermentation will slow down with the addition of salt, so adding it during mix will help when you have any of the reasons listed above for weak dough. Use cold or icy water during mix to keep the dough temperature down and slow the fermentation. If you mill your flour fresh, you can allow it to cool for a bit before mixing your dough. Finely mill your flour, it helps the gluten to bond better. The smaller the particles the less slicing damage they will do to the gluten. Use less mechanical mixing. Go for more of a “do nothing” or “do less” method which will minimize the gluten cutting of the bran and grain particles of whole grain flours. Add fats and other ingredients, that can interfere with gluten bonding, after the bonding takes place and you obtain a nice windowpane. 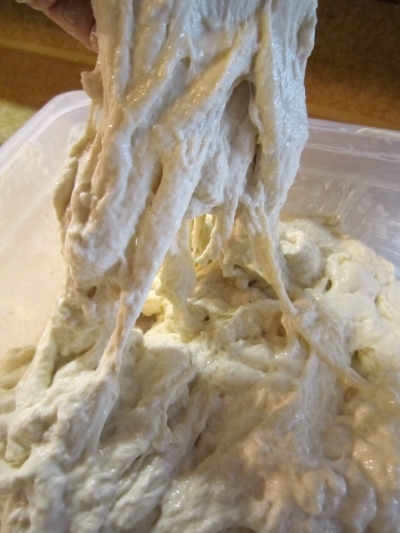 Cool your dough by refrigeration when ever you feel it needs to be slowed down. Also chilling the dough BEFORE shaping will even out the dough temperature so it isn’t warm in the middle longer than the outside and it allows a more even slow rising in the retarder/refrigerator. Mix or blend stronger flours with weaker flours. Blend strong white bread flour with a weaker whole grain flour. Use a lower hydration, it gives the gluten a better chance at bonding and slows down the enzyme action. Shorten your ferment time if possible. 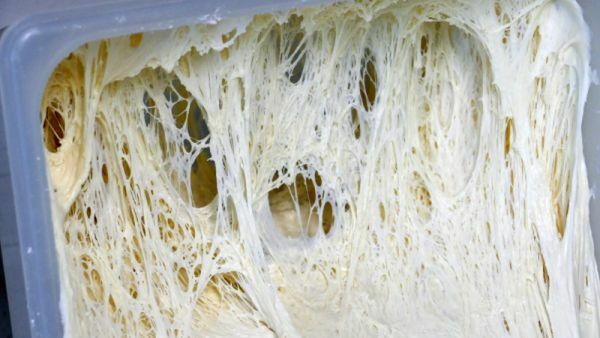 Cool the dough if you need a longer ferment. (more controversial) Add ascorbic acid (not citric acid) for gluten strength or vital gluten flour (I don’t care for vital gluten myself). 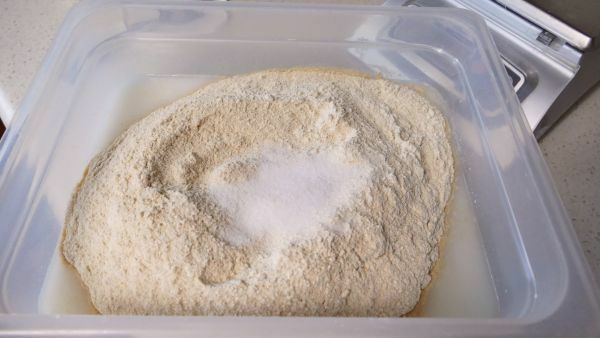 Use a double or triple hydration technique to get a strong bonding of the gluten before adding additional water (see photos below). Be gentle when handling the dough and shaping it. Don’t spray a lot of water on the dough before baking it (it can weaken the outer crust). Use a younger starter with stronger gluten instead of a weaker broken down starter. Consider sifting out the coarser bran, soften it with boiling water and then add it back to the dough after the gluten is developed and the bran is cooled. Err on the side of slightly under-proofing for the final proof. Use a very strong flour if you have an extreme fermentation schedule, higher temps or a dough with lots of gluten weakening additions. 100% Whole grain dough with salt added at mix time. 100% whole grain (whole wheat) dough right after mixing. 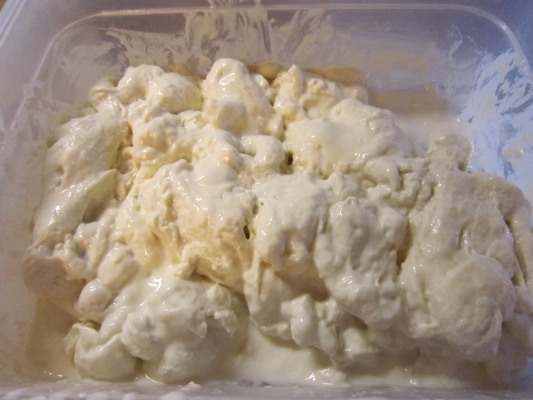 The dough was bulk fermented (rested) for two hours and then folded. 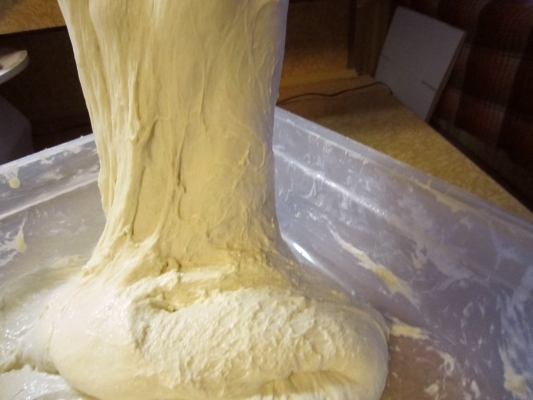 You CAN still rest the dough and allow it to hydrate and absorb water. Just because you add salt during mix to slow down enzyme action doesn’t mean you can’t also allow the dough to rest and hydrate before submitting it to more mechanical action (folding, mixing etc). 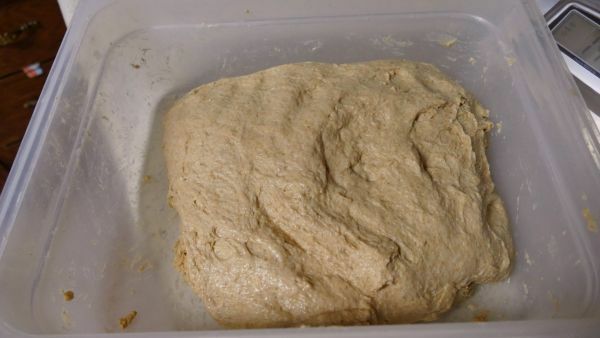 Technically you might not call it an autolyse, but resting the dough after initial mixing is a good thing to do. Allow the gluten to bond, hydrate and develop on it’s own. Allow the fibers and bran particles to become more fully hydrated and soften. Give the phytic acid a chance to break down to improve the nutrient absorption and digestibility of the bread. Triple hydration method started with a white bread flour. In the middle of a triple hydration attempt. The dough will come together with time. 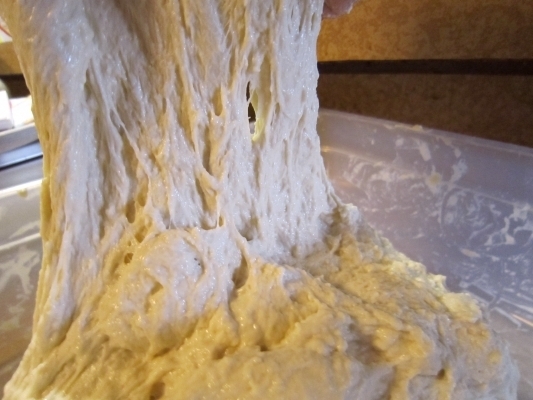 One of the reasons to use minimal mechanical dough mixing (folding or mixing) is to minimize the cutting action of the gluten by the bran and particles so the cooler the dough, the longer it can ferment and the more the gluten with bond and develop on it’s own without the intervention of mixing/folding. It can be a fine line to extend your dough ferment so you can avoid mechanical action and shorten the ferment so you can avoid the breakdown of the gluten by the enzyme action. It’s a good idea not to change the hydration more than 10-15% to prevent further weakening of the gluten. With time and gentle folding the dough has come together. If I think of anything else I’ll add it to the list. If you can add to the suggestions for protecting gluten in a weak dough, do so in the comments below. I look forward to your wisdom.